This post is sponsored by Science Studio by Bayer. All opinions are my own. “Mom, I’m borrrrred” are words I hear more often than I’d like. Immediately, in my mom-voice, I start to throw out suggestions of things my kids can go do -many of which get turned down on the spot. And so, it begins. 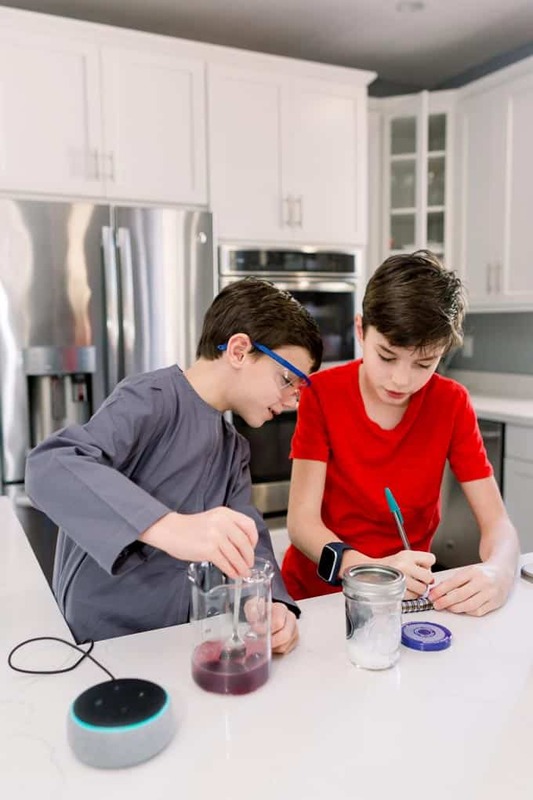 A frantic search on the web for games and experiments my kids can do at home immediately without requiring a trip to the store. And then I realize that our favorite in-home voice service, Alexa, has the answers! My kids already love talking to Alexa inside our Echo Dot about the weather, play music, tell jokes, and help them with their Spanish homework translations. I use my Echo Dot to ask Alexa to help me set multiple kitchen timers and add things to my to-do list. 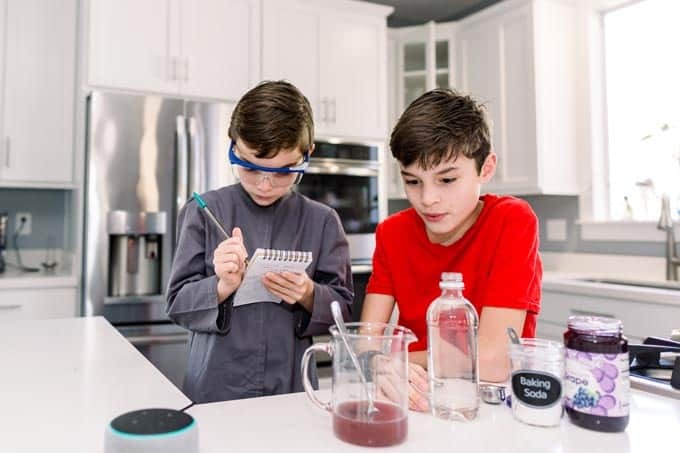 Recently, I’ve discovered the Science Studio by Bayer available on our Echo Dot where Alexa guides my kids through a series of kid-friendly science experiments they can do at home with things we already have. 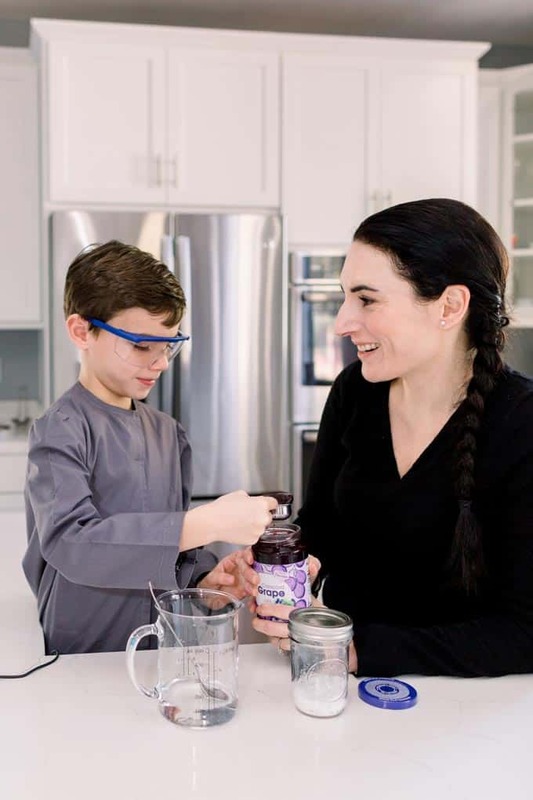 Simple science experiments my kids love like how to build an Alka-Rocket, How to Make Slime, Making Elephant’s Toothpaste, and the one we made the other day, the Martian Jelly. What I love about the Science Studio experiments is that they teach my kids simple and important science lessons that support their studies. The Martian Jelly, for example, was a lesson about chemical reactions. With the Martian Jelly, the kids learned that chemical reactions occur when one chemical comes into contact with another. For example, when you add baking soda (a base), it turns the solution basic and turns the purple color of the grape jelly solution to a greenish-black color. Then, when added vinegar (which contains acetic acid), the grape jelly solution re-acidifies, and the color changes back to purple. 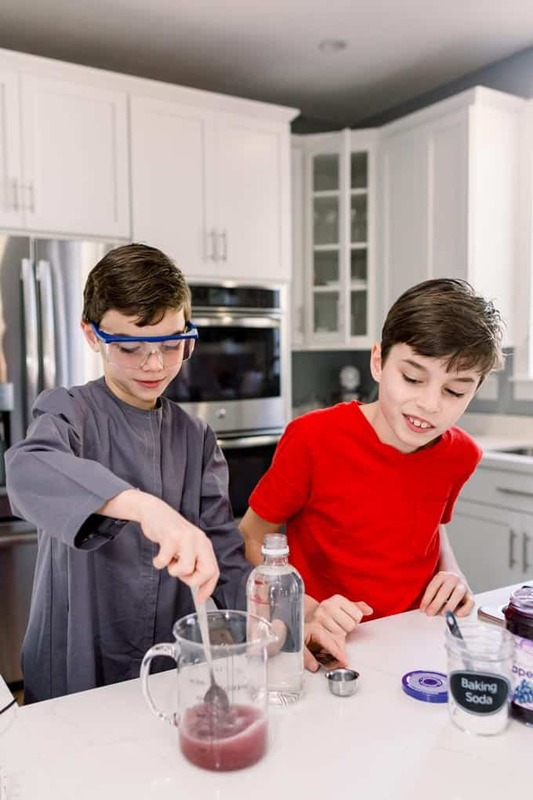 Also, mixing baking soda and vinegar together causes a reaction that releases a gas called carbon dioxide (CO2) –something that was a bit advanced for the boys but their sister in 7th grade knew all about. 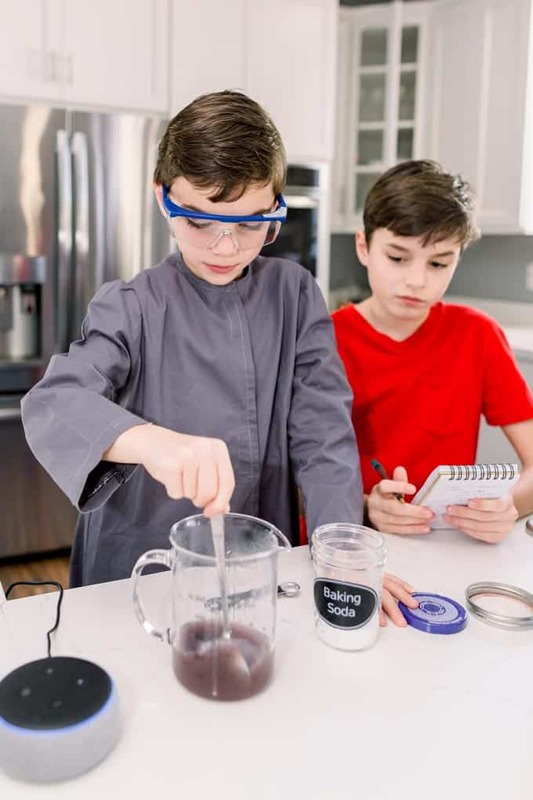 With a simple command of “Alexa, open Science Studio” the boys got started and my little scientists had everything we needed to make Martian Jelly in our kitchen. 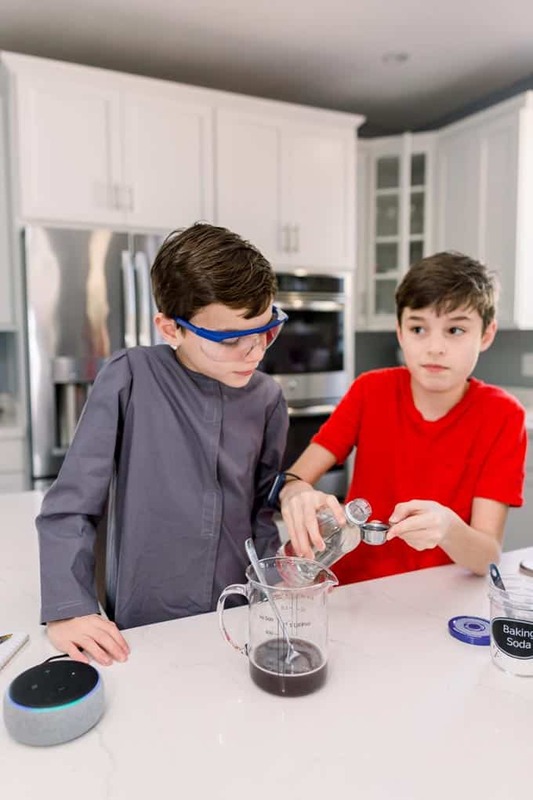 The Science Studio experiments is everything we hope interactive learning is for our kids: fun, engaging, and educational. 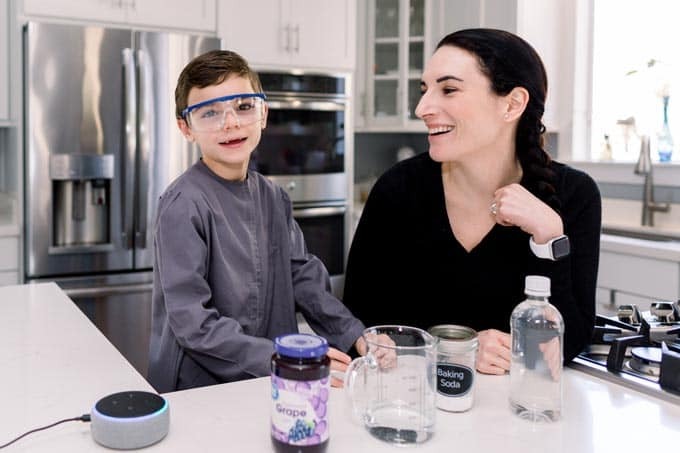 The boys began to measure out what they needed as Alexa, in her most patient voice, guided them step-by-step through the experiment. “This is so cool! The jelly turns black!” I could hear from the kitchen. We’ve so far made Martian Jelly and Elephant Toothpaste and both experiments have been a blast. I feel really good that they are doing educational activities that keep them off “electronic devices” while my kids are having fun. Their excitement about the experiments was contagious as they shared their new discoveries with their friends and repeated the experiments that same afternoon. It all starts with a “Alexa…” and I heard giggles on repeat from the kitchen. Science Studio by Bayer is available inside all Alexa-enabled devices and you can get started with a simple “Alexa, open Science Studio.” To learn more about Bayer’s Science Studio, check out the website here. Which of the Science Experiments will you try first? How fun! I had no idea my Alexa did that. Thank you for sharing Laura! We love our alexa when it comes to homework. What a neat idea! Its taken me a while to leave a comment here because I wanted to try the experiments. They’ve been SO MUCH FUN!! I sent out a link to the experiments to the 2,000 parents in our homeschool community board. Thank YOU!